In high school, I had a history teacher named Winslow Smith, who claimed that he taught because the way to become immortal was to live on in the memories of others. Winslow was playing a numbers game - if you teach enough students then one of them's bound to remember that thing you said in AP history in 1986. But the only number Grandma cared about was 2: her 2 sons. her two successful sons: the wine guy and the toilet guy. She was so proud of Chris and Dad - of their obvious success in their careers, to be sure… but her real pride she saved for the families they'd built. Speaking of family, I remember Patsy's mom, who I knew as Nan-Nan. I didn't get too many chances to spend time with her, but as a young boy I remember that she was the really nice lady who cried whenever she saw us. I understood it wasn't because she was sad - I think now it must have been tremendous pride to see what obviously handsome and well-behaved great-grandsons she had. And though Grandma showed the same pride in her family that her mom did, she wasn’t a crier - what I remember whenever we saw her was her laughter. Some of you saw that my brother and Erin got my Dad a slide scanner for Christmas, and he started sharing a number of his scans with us. (Kids - slides are like digital photos, only on pieces of plastic. You needed to put them in a big machine, then… oh nevermind. They're digital now. That's all you need to know.) Looking at the photos Dad sent us, we got to one of Grandma and Grandpa stepping off the plane in LA to meet me for the first time. Before I could stop myself, I blurted out: "Man, she was a hot grandma!" More importantly, you can see in those pictures the absolute love she had - for her son and daughter-in-law, and for her grandson. In the same year that Grandma and Grandpa celebrated their 50th wedding anniversary, Robin and I got married. I loved getting the chance to honor their life together at our wedding; as some of you will recall Grandpa made sure to corner Robin at the reception to make sure that she knew she had to name her first-born Richard. What fewer know is that while that conversation was happening, Grandma whispered to me that Grandpa wasn't kidding! A few years later, when Robin and I took the boys to visit Grandma and Grandpa in Florida, it was amazing to watch as she took to the role of doting great-grandmother - and the love for her great-grandsons is as obvious in those photos as it was in the photos from 30 years prior when she visited my parents in California. As some of you know I've spent a bunch of time in the last year studying our family's ancestry. With the Dawsons, I'd run into a wall with Nan-Nan's parents. In one of my calls to Grandma last year I asked if she knew anything about her great-grandparents. Not much, she said - but she recalled some papers she had lying around that could help. She mailed them to me, and I was excited to discover that she had the names of her great-great-grandparents - names I hadn't been able to find. From that, I traced her roots to an original settler in Pennsylvania Dutch country - the house built by her 7th great-grandfather in 1727 still stands in Lancaster, Pennsylvania, just a few miles from my parents' house. 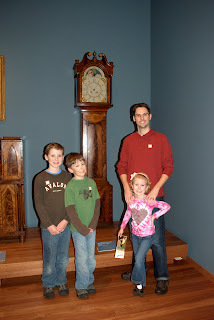 Her 3rd great-grandfather, Jacob Eby, was a renowned clock-maker - and over Christmas Robin and I took the kids to a museum in San Francisco that has one of his clocks on permanent display. Grandma was delighted at each of these discoveries - though she warned me that I might not like everything I found (I *think* she was kidding, but if any of you have stories for me, let's grab a beer later!). The best moments from this research were when I got to share my discoveries with her. Her only regret (and mine) was that I didn't do this sooner, when I would have had a chance to share this with Grandpa, who would've loved to know that a great-grandfather of his was a Colonel who led a regiment of Milwaukee soldiers in the Civil war, or that an ancestor of ours was the royal photographer in the Prussian kingdom in the 19th century, or that his fourth great-grandfather was one of the original German settlers in Milwaukee - its first gunsmith, and the owner of the first house in the city. I miss Grandma. I miss our long phone calls when I'd call her on my drive to work. I miss hearing her take such incredible interest in how the kids were doing, and her absolute delight at what a strong-willed great-granddaughter she had. I miss her scolding me if she thought I wasn't showing Robin enough gratitude for being such a great wife and mother. But mostly I'm grateful for the incredible amount of time we did get together. I've thought a lot about my old history teacher's comments, and I think he had it a bit wrong. It's not the memories themselves that we should be focused on. Sure, the memories are important. It's not so much that Grandma lives on through our memories, it's that we will honor her memory by embracing who she was, and carrying that with us in what we do. We'll remember to laugh louder, smile a little wider, trace the kids' faces at night, respond "I love *you* more" when someone tells us they love us, or recite one of the many poems she left behind to brighten our days. If we do *that*, we'll continue to make her proud of us. On the plane ride here, Ricky told me quite seriously: "Dad, it's kind of sad that we're going to Milwaukee, but I think it should be a celebration. Not that she's dead, I mean… but that she had such a happy life." I think he's right. She lived a long, happy life - and as she left us, she knew that she had much to be proud of. I'm grateful for that, and am so glad we've had this chance to honor that memory as we celebrate a long life well lived. We know you love us, Grandma, and we love you more. May your grand-mom rest in peace where ever she be! !And hope you get lots of strength! I wont say its a lost* For I know been lucky to have spent the best of her times with you and family. And definitely she might be a Happy human to have looked so charming...the happiness on face actually gets reflected her face. Above all she will always reside in your sweet memories & your warm hearts!! !I so much liked reading your post..the pictures..no doubt she looked so beautiful even with wrinkles & lines on face!! Love LOve Love to her always!! Thanks for sharing this Rick. Reminds us all of our ancestry and the impact our parents/grandparents have on us and our kids. With people living longer today, there is going to be greater opportunity for this. 3 of my grandparents died in their 60's and 70's. Your post was special for me reminding me of the impact my Mom had on me and my kids. She died earlier this year and her birthday was this week. Be well and continue to do great stuff.